Below are the top 5 most visited items from each category within our Research Center for 2018. If you missed any previous newsletters, this is a great way to catch up!! 2. Are You Using the Team Planner View Feature in Microsoft Project? The following table has been developed to quickly compare the three different methodologies of DAD, SAFe and Scrum along-side their seven respective domains of; roles, processes, artifacts, benefits, complexity, usage, and tools. Scalable throughout entire organization – Not prescriptive. Scalable throughout entire organization – Very prescriptive. Below are the top 5 most visited items from each category within our Research Center for 2016. 5. Measuring your way to failure? Tons of Articles, Videos, Podcasts and Templates related to Agile, Kanban and Scrum can be found in our ever growing database. They can be sorted alphabetically, by date added, by rating or by popularity. See the full list here. Below are the top 5 most visited items from each category within our Research Center for 2015. 1 Create your own carousel on the PWA home page!! 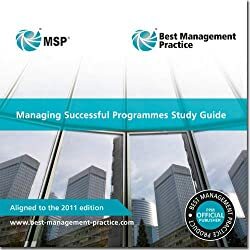 - Integrated with "The Project Management Search Engine"
Within this database you will find all 84 terms and definitions located with the Managing Successful Programmes Glossary, the 2011 Edition. Expand your Program Management vocabulary, or if you are studying for one of the MSP® Certification exams, you can use this site like flashcards to help you memorize the definitions. 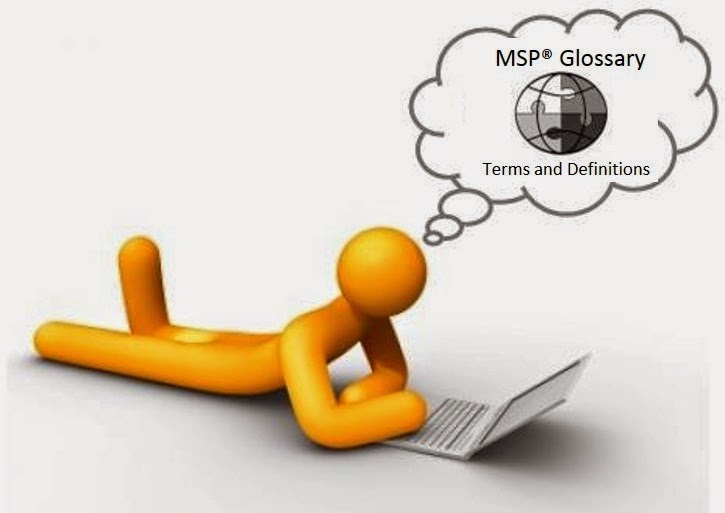 MSP® Glossary Terms and Definitions here. These are summary notes from the 2011 Edition. 1.2. What is a Program? – A temporary, flexible organization created to coordinate, direct and oversee the implementation of related projects and activities in order to deliver outcomes and benefits related to the organization’s strategic objective. 1.3. 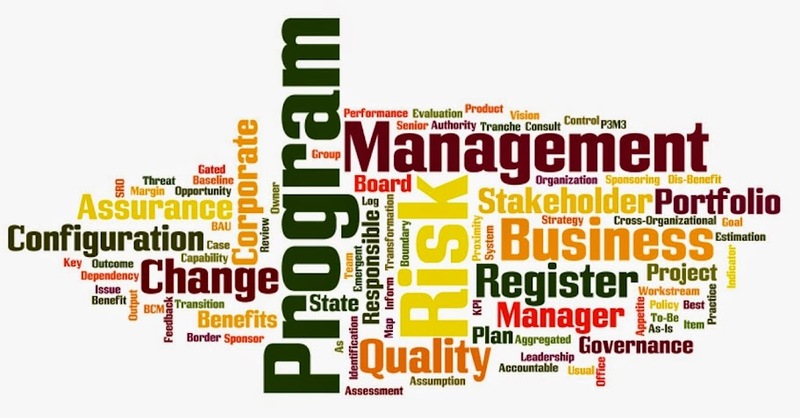 What is Program Management? 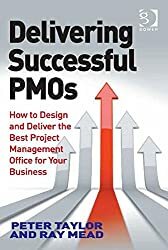 – The action of carrying out the coordinated organization, direction and implementation of a dossier of projects and transformation activities to achieve outcomes and realize benefits of strategic importance to the business. 1.8. When to use MSP? 4.8. Program Manager – Responsible for leading, managing, set up of the program, delivery of capability, realization of benefits, closure of program. Business Change Manager – Responsible for benefits realization via their adoption. 4.10.Business Change Team – Group that could be formed to help the BCM by guiding stakeholders through the change cycle. 5.4.3. Managing the Tranches – Act as a beacon. Used to guide decision making. 5.4.6. Closing a Program – Test is to see if it has been achieved. Some benefits may remain to be realized. 6.6.4. Planning the engagement – When. Engagement is more active and embracing than communications. 7.1. Introduction – The heart of Program Management. 7.4.2.2.3.1. Where will benefit arise? 7.4.2.2.3.2. Can this program claim benefit? 7.4.2.2.3.3. Is accountability and responsibility clear? 8.2. Blueprint Design - Blueprint is model of future organization, its practices and processes and the information it requires and the technology that supports its operation. Blueprint provides Target Operating Model. 8.2.1. Future State – Blueprint shows intermediate future state. Blueprint describes the elements of the future organization. It is the combination of these elements that enable outcome. 8.4.5. Realizing the Benefits – The blueprint provides the “as is” state. This is the baseline to compare against. 8.4.6. Closing a Program – Success will be measured on whether capability was delivered as defined in Blueprint. 9.2.6. Scheduling – The program treats each project as a black box. Use Dependency Network. An APMG-US representative will contact you to advise you on venue options and to complete the booking process.